Tanya Elloitt Nyegaard was born in Copenhagen in 1965 and came to Ireland as a child. A graduate of the Limerick School of Art and Design (1983 - 1987) Her influences include Ingres, Matisse and Brancussi. She runs the Dublin Art Foundry along with John Gannon and Les Manning. Her uncommissioned work is mainly figurative capturing the essence of a pose, mood or emotion. "My uncommissioned work is mainly figurative and has been since I began making sculpture. If you were to try to find an underlying aspiration in my work it would be an attempt to get the essence of a pose, mood or emotion in the figure. I prefer to work directly from a model and often you will see I have not "filled in all the gaps" for the audience. I like the notion also of working in wax, a soft malleable material and then casting in bronze. The transition from one to the other fascinates me." Her public commissions include a special commission for the Imperial Prince of Japan from the Irish Government. A "Fish Column" for Dundalk UDC and a life size "Garda and Park Bench" for Glen Dimplex (documented in an exhibition at the R H A. She has exhibited her work in Limerick City Art Gallery R H, Iontas and Oireachtas Annual exhibitions. Other works include three, three foot figures (De La Salle Brother and Two Boys), pieces for I A V I (Irish Auctioneers and Valuer's Institute), Woman of the Year Award '93, 94, 95', Large Bronze piece for Blackrock (Louth) Millennium Project. 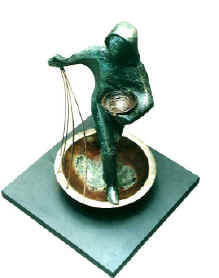 Piece commissioned as award for Wild Goose Award for French/Ireland Fund, D C U Calmative Plaques (portraits) 1992, presentation to Justice O'Higgins, A I B Export Award 1995 - 1996, Environment Awards (Tara Mines), R T E 25 year Award, Lahinch Golf Trophy's, Royal Dublin Captain's Prize. Work in A I B Collection. Presently, Tanya is working on a voluntary project for Howth Road National School, all students hands cast in Bronze capturing these children at the end of this Millennium and the beginning of the next.